Minnesota Vikings running back Adrian Peterson has been suspended without pay for the rest of the 2014 season, the NFL announced on Tuesday. 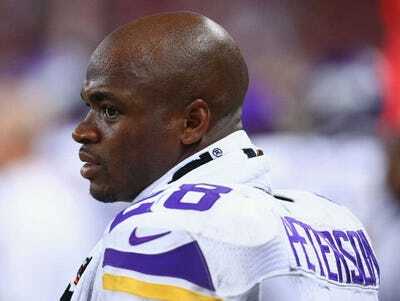 Peterson pleaded no contest to misdemeanour reckless assault of a child in Texas on November 4. He had been suspended with pay since early September when he was indicted for beating his four-year-old son with a tree branch. Citing the new personal conduct policy, which calls for a six-game suspension for first-time domestic abuse offenders, the league banned Peterson for the rest of the year. Commissioner Roger Goodell explained the decision in a letter to Peterson. He said that Peterson inflicted “criminal physical abuse” on his son and showed no remorse afterward. “First, the injury was inflicted on a child who was only four years old. The difference in size and strength between you and the child is significant, and your actions clearly caused physical injury to the child. While an adult may have a number of options when confronted with abuse — to flee, to fight back, or to seek help from law enforcement — none of those options is realistically available to a four-year old child. Further, the injury inflicted on your son includes the emotional and psychological trauma to a young child who suffers criminal physical abuse at the hands of his father. Peterson can appeal the decision. If it stands, he can apply for reinstatement on April 15. Goodell said Peterson could be banned for life if another incident occurs.